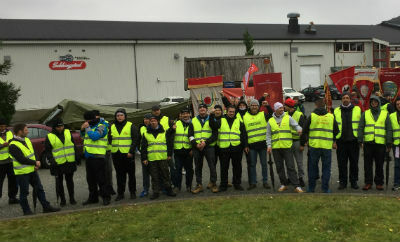 Norway: Sekkingstad and Sund, stop union busting! In partnership with the Norwegian Food and Allied Workers Union (NNN), the trade union for 30.000 workers in the food industry in Norway and the IUF, an international federation of trade unions representing workers employed in agriculture and plantations; the preparation and manufacture of food and beverages; hotels, restaurants and catering services; all stages of tobacco processing. The IUF is composed of 414 affiliated trade unions in 128 countries representing over 10 million workers. After a 35 days strike last autumn, Norse Production finally signed a collective bargaining agreement for the fish processing sector. Norse Production was a subcontractor of Sekkingstad AS, a large company that exports salmon to more than 100 retailers and processing companies all over the world. The company had a turnover of more than 2 billion Norwegian kroner (0,21 billion Euros) in 2017. Then the owners bankrupted Norse Production. A few days later, Sekkingstad AS established a new subcontractor, Sund Laksepakkeri, in the same place and with almost exactly the same management. None of the organized workers from Norse Production were hired in the new company and the collective agreement is gone. The bankruptcy of Norse Production and the establishment of a new company was a planned action from Sekkingstad AS to get rid of the organized workers and the collective agreement. This is union busting, and we cannot accept this. Send your protests to the owners and managers of Sekkingstad and Sund Laksepakkeri. This campaign was closed at the request of the union on 13 September 2018. The issues remain unresolved.